If you have been injured while working on an offshore oil rig, attorneys at The Dunahoe Law Firm, in Natchitoches, Louisiana can help. Preserve your legal right to seek compensation for your injuries by contacting our attorneys now. Call 800-259-4460 now or complete the Contact Us form located on this page. A free legal case review will determine if our law firm can help you receive compensation for your injuries. 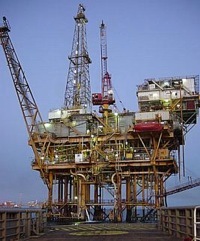 Offshore oil rig workers in the United States are often protected under the Jones Act when injured. While originally written to protect merchant seaman, it also protects oil rig workers, shrimp boat fisherman, water ferry operators, and many others. Jones Act litigation can be complex and an attorney from our law firm will help to make sense of it all. The Jones Act is a section of the Merchant Marine Act of 1920. Section 27, titled the Jones Act, allows injured sailors, and normally oil rig workers, to obtain damages for injuries. The Merchant Marine Act and Jones Act are complex documents that can lead to complex litigation. An experienced attorney is essential if you are eligible for protection under the Jones Act. Oil rigs are some the most dangerous work environments in the world. While most injuries may occur while at work on the rigs, when workers are injured while being transported to and from the rig, protection under the Jones Act often still applies. After injuries occur, your employer might suggest that hiring an attorney is not necessary. You might be asked to sign confusing documents and waive your rights to seek further compensation if you do. Please consult a legal professional before signing anything. The Dunahoe Law Firm is based in Natchitoches, Louisiana. Our attorneys are prepared to represent clients throughout the entire state of Louisiana. When required, our attorneys will travel to meet with you. We go the extra mile for our injured clients and look forward to hearing from you. Call 800-259-4460 now or complete the Contact Us form on this page to get help now.